When we moved to Japan in 2016, it was honestly pretty simple to get our pup here with us. Okay, it was 100% stressful to juggle all of the pup requirements while also organizing an OCONUS move with a toddler. But, on balance, pretty easy and not all that pricey in the grand scheme of things. We could ship our dog as cargo using a DIY method, allowing him to join us a few weeks after we arrived in Okinawa. Now, that option doesn’t seem to be possible. In the last three years, a good bit has changed when it comes to shipping cats and dogs between the US and overseas military duty stations. As we head into the heart of PCS season, it’s time for you to get the skinny on updated rules to moving with your furry family members. First things first, every single country has their own set of rules you’ll need to follow in order to bring your pet when you PCS. Yes, you must follow the host nation’s rules EVEN when executing military orders. Most countries will require vaccinations and a period of quarantine. For example, Japan requires the rabies vaccine and a 180 day quarantine; there are several other vaccinations recommended for different animal species. To check the specific import requirements, please consult the USDA website. It’s also important to remember that the US also has rules for bringing back animals from other countries. You’ll need to follow specific rules for areas with screwtape or Foot and Mouth Disease. Whether you’re leaving the US or coming back home, you’ll need to get an official health certificate from either a US military or USDA-certified veterinarian. Try to get the health certificate as close to your flight date as possible. TL;DR: you’ll need to get a series of vaccines, probably keep your animal away from others and get a health certificate. Okay, here’s the thing: getting your pet through the different hoops for import is just part one of your journey. Now, you’ve got to actually get your pet onto a flight or series of flights. Every single option will have a cost associated with it, though the final bill will vary based on your preferred transit method and your pet’s breed and size. AMC flights are generally the cheapest, but also the most difficult to book. Using a pet shipper will be generally the most expensive since they take care of everything. Accompanying your pet yourself on a commercial flight or shipping your pet as cargo are somewhere in the middle, cost wise. There are a limited amount of spots on the AMC rotators and, honestly, they book up quickly. You can attempt to book a pet spot once you receive your orders and get the moving process moving. It’s first come, first served so be prepared to act fast! On the Patriot, animals are defined as dogs and cats only. So if you have any other pets, you’ll need to rehome them, find a foster home or ship them another way. Costs can vary between $125 and $375. While there are minimal breed restrictions, except those imposed by the host nation and/or base housing, you cannot transport animals over 150lbs (combined weight of kennel and animal). You can move your pets yourself, without involving a pet shipper, in certain cases. Some airlines are still flying pets, in cabin or in the belly of the plane as accompanied baggage and cargo. Generally, costs are lower than using a pet shipping service. There might be some exceptions to policy for military families traveling on PCS orders. The three major US-based airlines are Delta, United and American. There might be other international airlines available to or from your specific destination. Some airlines allow dogs that exceed the size and/or weight restrictions to be shipped as cargo instead of as accompanied baggage. There are different costs associated with the various kennel sizes and weights, as well as for cargo, accompanied baggage and in-cabin options. If you’re flying commercial, you’ll need to contact your airline in order to book your pet’s travel arrangements. You will pay the travel costs directly to the airline. There might be some additional requirements for international travel. Learn more about individual US-based carrier pet travel restrictions on AMC’s Pet Travel page. This is how we’re getting our Schnauzer back to the US this PCS. Yes, it’s the most expensive but it’s also the most convenient for us. Using a pet shipper allows us to send our pup ahead of us. That will make the actual travel portion easier – or as easy as traveling with a five-year-old and a two-year-old can get. To ship with a shipping company, you can use the International Pet and Animal Transportation Association (IPATA) to find your options. There are several IPATA companies that specialize in transporting pets for military families. The cost to transport your pet will depend on your location, your pet’s size and your final destination. Some shippers will offer either accompanied or unaccompanied travel options. The benefit of working with a shipping company is that they literally walk you through the entire process, letting you know when to do each step. It also gives you a little bit of flexibility, allowing for advanced or delayed travel. There’s been a lot of chatter in the military community about major changes to pet shipping, especially when it comes to moving overseas and particularly Asia. These changes have definitely impacted how military members are moving with their pets this PCS season. Military members are seeing increased costs due to fewer options. In response, the military branches have been working to provide more flexibility with AMC pet spots and routing families onto commercial flights with their pets. All the changes and logistics of moving to or from OCONUS locations with pets creates a lot of confusion. To help answer questions, military members can turn to social media and pet shipping companies. One great resource is Military Pets United, a military spouse-run Facebook group that helps provide answers, recommendations and resources. Have some wisdom to make PCSing with pets easier? Share your tips and tricks with us! Easy Ways for Your MilFam to Be More Earth-Friendly! April is spring cleaning season – and it’s also a great time to do a complete review and reset of your routines, making switches to be more earth-friendly. Luckily, it’s pretty easy for your busy military family to start new eco-friendly habits that fit a busy, modern life. Making changes to your habits and routines is hard. I get it: I’m a busy mom with two little kids. So keeping things easy and fast is the name of my game. You’ve got to give me a pretty compelling reason to cause me to change my ways. And being better to our planet is about as compelling as it gets! By making these smart swaps, you’ll be conserving resources like energy and materials. In addition, you’ll be reducing your trash production and maybe even decreasing your spending! What do you reach for when you’re packing lunches or leftovers? If you’re like me, you’re grabbing plastic wrap or plastic bags. With four lunches to pack every day plus some leftovers from dinner each night, all that plastic adds up fast! Using these earth-friendly options, after your initial expense, will save you money over time. You’ll be using your eco-friendly food storage options again and again instead of spending money every week on plastic products. Plus, using reusable containers is so much better for the earth! You know what’s easy? Using the plastic bags available at every checkout in the grocery store. But all that plastic adds up. Remember, plastic takes literally forever to breakdown. Instead, stick a stash of cloth grocery bags or totes in your car. Whenever you go grocery shopping, grab a few bags and use these to pack your food. This had become second nature to me, especially after living overseas for three years. Most Japanese stores charge a few yen per plastic bag to encourage reusable bags. Many US stores and even some states are following this trend. If you’re worried about forgetting your cloth bags, run them back out to your car immediately after you unpack. You can also grab some compactable bags – ones that roll up really tiny – and just stick a few into your purse. My heart breaks a little bit whenever I see food start to turn in the fridge or on the counter. I can almost see the money flying out the window! I’ve managed to stop wasting food (mostly) by meal planning every single week. I try not to stray from my list either. Limiting my grocery shopping to what’s on the menu helps to end food waste. Every item in my cart has a purpose, a meal that is planned. Finding ways to save or use your “extra” food helps to cut waste and save money. Even if you’re skipping plastic products and cutting food waste, you might still be creating more trash than needed. A lot of things you’re tossing in the garbage might actually be recyclable! You can also recycle cardboard, including paper towel rolls, and papers, like magazines and even old homework assignments. Once you’re done crafting, pop the items back into the recycling bins! Following these simple tips and making easy swaps can totally cut your carbon footprint while also reducing spending. Is your family trying to be more eco-friendly? Share your best tips with us! You want to know what’s more complicated than a PCS? Try adding in the extra responsibilities of moving with kids in school. Yup, once your kids enter school, moving becomes a whole new ball game! Between finding a good school, organizing the paperwork and making the best school work within your BAH or ideal commuting range, it’s quite a lot to juggle. Luckily, if you follow a few super simple tips you can make your PCS with school-aged kids so much easier. Now, making your move easier will (ironically) take a little bit of planning and prep. I promise that it’s so worth it! Over in the Stress-Free PCS Challenge, the first step is to connect the dots and triangulate your wants. What’s on your must-have and nice-to-have lists? As we’re house hunting, these are the criteria we are looking for in our next community or neighborhood. Now, obviously, getting everything on this list is the best case scenario. So we’ve decided that having at least three of these five “wants” is going to be enough for us. Before you even start your deep dive into which schools are “best,” get your priorities straight and start your house hunt. Keep your list of ideals in mind at all times. Once you narrow down your search area based on your criteria, it will make your moving process so much simpler. Every child is unique. Not every school will work for every child. And that’s okay! Creating a small overview of your child will help you to rule schools in or out as you search. For example, you wouldn’t really want to send your soccer loving child to a school without a soccer program. If you’ve been around the PCS block a few times, you probably already have a binder (or 10) floating around. You might not exactly want to add another binder to your collection, but it’s 100% worth it. Legal documents: custody paperwork, adoption paperwork, etc. You can grab a free binder organizer, along with other great checklists, in the Stress-Free PCS Challenge! Having all your documents in one place makes it easier to find just the right item when you need it most. It’s also important to make multiple copies of essential info, like the academic records and any education plans. There are three major ranking websites: Niche, GreatSchools and School Digger. Each draws on the same hard data, like state testing scores and demographics. The numbers are run in several different ways on each website, with the final “grade” based on a variety of factors. These scores, plus the state Department of Education’s school report card, give a great snapshot of the school’s success. You’re looking for a high passing percentage on state tests, a high graduation rate, and average or better community reviews posted within the last five years. When it comes to these scores and websites, you’re looking for consistency across platforms. It’s a red flag when a school is ranked average in several places, with a super high ranking on a different website. It’s also important to remember that the ranking websites compare schools in one region or state against each other. So a 5/10 in a high achieving area, like Northern Virginia, may not mean the same thing as a 5/10 in another area. Before you right off a school because of a perceived lower ranking. Instead, check the actual percentage of kids in the school who are achieving proficiency or higher on state tests. A high ranking is great. Hearing positive things from other parents is good, too. But it’s not everything. A high achieving school with good reviews doesn’t mean your child will feel comfortable or successful there. Building a personal connection can be the make or break factor in deciding where to live and send your children to school. Remember to keep notes on your conversations, storing everything in your binder. What are your tips to PCS with school-aged kids? Ahhhh, spring! Bees are buzzing, flowers are blooming and I’m over here sweeping the floors. It’s spring cleaning time again. This year, I’m searching for ways to cut to the chase and make my annual (okay, quarterly because kids) cleaning spree a little bit simpler. Plus, I’d love to find ways to make everything just a smidge more environmentally friendly. essential oils – lemon, lavender, citronella, etc. These are all products that are readily available in most grocery or big box stores. You can DIY your own dust rags from older t-shirts, cloth diapers or other soft clothes. We actually cut up diaper changing pad covers. The soft-yet-tough terry cloth scrubs off even the most stuck on of messes on the counters or walls. Yes, walls. Did I mention I’ve got kids? Even with my sometimes messy kids underfoot, I actually use all of these cleaning techniques in my own house. And I keep on using them because they work! Start with your top-fill washing machine. Set it to the hottest and largest setting. Fill up your machine, then add a cup of white vinegar and 1/4 cup baking soda. Close the lid and let it agitate for 3-5 minutes. Then open the top again and let it sit for a few hours. When time’s up, dip a dust cloth into the water and wipe down all the exposed parts in the drum. On a front load washer, add the vinegar and baking soda before you start the machine. Then let it go through a complete cycle on the hottest setting. When it’s done, use a dust cloth to wipe down the rubber seal around the door. If you have counters in your laundry room, wipe them down with a mixture of vinegar, baking soda and your favorite essential oil. Use just a drop or two of the oil to cut the vinegar smell. Spray onto the counters and wipe with a dust cloth. I don’t know about you, but my kitchen sink stinks to high heaven after a few days of heavy dishwashing. All the food and bits of stuff gets stuck down in there and just plain smells. When it gets really yucky, I peel a lemon. Yup, a lemon. I drop a few pieces of lemon peel into the garbage disposal. Then I run the water really hot and turn on the disposal until it’s flushed through. For a deeper clean in your sink drain, add 1/4 cup baking soda to the drain and pour in a cup or so of vinegar. It should bubble and foam. That’s the cleaning action! Again, run the water really hot or pour some boiling water down the drain to flush. You can use this strategy on any sink in your house! To really clean your counters, sprinkle a little bit of Bon Ami cleaner and use a smidge of water to mix it into a paste. Follow the directions on the container to rinse your counters clean. You can also use Bon Ami to clean pretty much any non-porous surface in your home, from the kitchen to bathrooms! You know what makes windows sparkle? Vinegar. If you’ve been tracking so far, you’ll have noticed that vinegar is a theme in eco-friendly cleaning. Create a mix of vinegar and water. Spritz it onto your windows, mirrors and any other glass surfaces in your home. Wipe clean with a dust cloth. Mold and mildew just love to take up residence in my showers and on my kids bath toys. They get really slimy, really quickly. When I’m looking to get rid of mold in the shower or tub (and anywhere else), I squirt a little bit of vinegar onto the moldy places and let it sit. Then I rinse it off with really hot water. For really stubborn mold or mildew, make a paste with a bit of baking soda and water. Scrub the spots that need extra attention, then repeat the vinegar mold removal steps. Rise with hot water. For bath toys, run a hot bath. We’re talking scalding temperatures. Add a good bit of vinegar and let the toys soak in the water for a while. Then add some baking soda and let everything foam up a bit. After soaking the toys a little longer, drain the tub and rise each toy in hot water. Let them dry on some of your DIY dust clothes. Finish your cleaning up with a good clean floor. Grab some more vinegar and add about 1/2 cup to a gallon of hot water. While it cools off just a touch, do a quick sweep of your floors to get up all the big crumbs and dry messes. Then mop as normal with the vinegar solution. You can cut the vinegar smell by adding a few drops of essential oils to your floor solution. Literally, just a drop or two will do the trick. To freshen up your carpets, sprinkle baking soda over them. Let it sit for a while. You could do this as the first step in your spring cleaning routine. Or, if you know no one will mess with it overnight and before you start cleaning, sprinkle your carpets before you go to sleep. When you’re ready, just vacuum up the baking soda! The natural odor absorbers in the baking soda will capture the yucky smells and leave your carpets springtime fresh! What are your spring cleaning tips and tricks? We’d love to check out your best ideas! When my parents were house shopping, way back in the early 1980s, they made a list of possible properties. Then they went to each and every home to take a tour. And then, after weighing all the options and running the numbers, they made a decision. They took their time, were careful. Cut to 2015. And I’m looking for a house across the country from where I currently live. There won’t be any in-person home tours for me, just a bunch of online listings with a ton of (possibly misleadingly staged) photos. My contact with the listing agent or home owner will be almost exclusively through email. So far, we’ve been pretty lucky. There haven’t been any real issues for us yet, knock on wood. How have we managed to hit the rental property lottery so often over the course of a decade of military life? Honestly, I don’t know. But this year we’re on the hunt yet again. Except that this time there are several continents and an ocean in between our current location and where we’re looking for homes. This year, we’re trying a few different techniques to find our next rental home from far away. First, you need a place to move. As long as you’ve got a general next location, you’re golden. Take my advice, gained over the last 10 years, and do not house hunt before those orders drop. It just leads to disappointment all around. Once you know where you’re headed, start narrowing down your possible options. Once we’ve set up these parameters, it narrows down our search area. This allows us to focus on just one or two specific zip codes or a few neighborhoods instead of hunting everywhere. My first step in years past has been Craigslist. Even I’m cringing right now, typing the sentence. Even as recently as 2012, going the Cragislist route might have been okay. But between then and now, it’s gotten a good bit sketchier. Which leads me to the apps. We’re talking Zillow, Trulia and MilitaryByOwner. Most properties are cross-posted, but there could be a rare gem that’s only listed on one of the apps. We’ve also noticed that sometimes the same property has different pictures on the different apps. I really like MBO because it’s military specific. The homes listed as typically owned by military families, either active duty or retired personnel. And they’re looking for military tenants. You can also search by proximity to your preferred base. I’m constantly scanning the search results on all three of my apps. I mix up my filters, switching up zip codes and rental prices. Using the real estate search sites allows me to narrow down my search, excluding any houses that don’t fit my exact criteria. That saves me some heartache in the long run. Back in 2015, I found a home in the perfect location with the exact right features via Facebook. The current tenants, another military family, posted their rental property that was coming up for a new family. I reached out, sent a message and within just a few days that house was ours! In just the last few years, tons and tons of Facebook groups have sprung up aiming to help families PCSing. They are location specific and members can post housing searches and listings. These Facebook PCS-specific groups as well as more general military spouse groups create easy ways to grab houses before they hit the market. Plus, by using your connections, you’re able to rent a property that is already military family-approved! I love leg day at the gym, but don’t really enjoy chasing down real estate leads. Still, getting into the most ideal home for us does require a good bit of work. With each promising house that pops up in the searches, I mark it. It goes onto the list of the day. My husband and I sit down to go over the options every night or so. the houses we decide to keep on the list each get an email via one of the apps. Now, not every email we send doesn’t get a response. The people we do hear back from, we review those responses and decide which homes to pursue further. Now, in the past, we’ve done this mostly alone, with maybe a little help from Facebook connections and military spouse groups. That’s just not cutting it with an OCONUS move. So this time around, we enlisted the expert advice of a Realtor. We chose someone who also happens to be a military spouse. She’s totally in touch with the unique concerns and considerations of this lifestyle. It’s been so helpful to have an extra set of eyes looking for properties! Plus, should we need someone to visit a home or give us a neutral opinion, she’s right there for us. And our Realtor can also get paperwork started on our behalf. Seriously, I don’t know why we didn’t go this route sooner! How do you search for your next home when you’re far away? Share your tips and tricks! As military families, we have a lot of complications and balls in the air. Consistently, one of our top worries is about our military kids and their education. Between moving every three years during the K-12 years and saving for their college educations, it’s a lot! April, being the Month of the Military Child, brings the focus onto the needs of our military kids, especially their education. It’s also a great time to find cool resources and opportunities to help support your military kid and their education! Educating a child, through the K-12 years or at college, is expensive. Military families are always on the hunt for ways to make this more affordable and possible with budgeting and scholarships. Every little bit totally helps. Which makes scholarships and grants a great resource for military families. In honor of Month of the Military Child, Nabisco and Coca-Cola have come together in support of military families to award scholarships to six lucky winners. One Grand Prize winner will win $5,000 in the form of a check! Or you could win one (1) of five (5) first prizes consisting of $1,000 in the form of a check! We love a good scholarship, especially one that’s easy to apply for and comes with very few strings attached. That makes the scholarship from Nabisco and Coca-Cola so sweet! There’s no purchase necessary to enter or win. And you can enter once daily through 4/30/2019! Sending a child to college or paying for private school is expensive! Between tuition, fees, uniforms and supplies, the bills collect awfully fast. Having some financial support is often crucial to making quality education a reality. There are lots of great scholarships for military kids, including this new opportunity from Nabisco and Coca-Cola. A quick Google search will bring you to lots of information about scholarships for K-12 schools and colleges, both generally and specifically for military kids. With a little bit of financial support, there is so much opportunity for education and success! Just thinking about what that $5,000 check or even the $1,000 check would do for a military child is incredible. We’re talking books and school supplies. Maybe even a decent chunk of tuition or fees. Every little bit of financial support truly helps! Throughout April, in honor of the Month of the Military Child, Nabisco and Coca-Cola are offering the chance to win one of five $1,000 checks or the grand prize, a $5,000 check, to help support your military child’s education. To enter, please text PURPLE to 89884* for a chance to win up to $5,000 for your child’s education! You can also enter online at www.NabiscoMilitaryMonth.com. This scholarship is 100% limited to military families. April is the Month of Military Child, honoring the support, service and sacrifices of our military connected kids. All month long, please Purple Up to show your support of military kids! 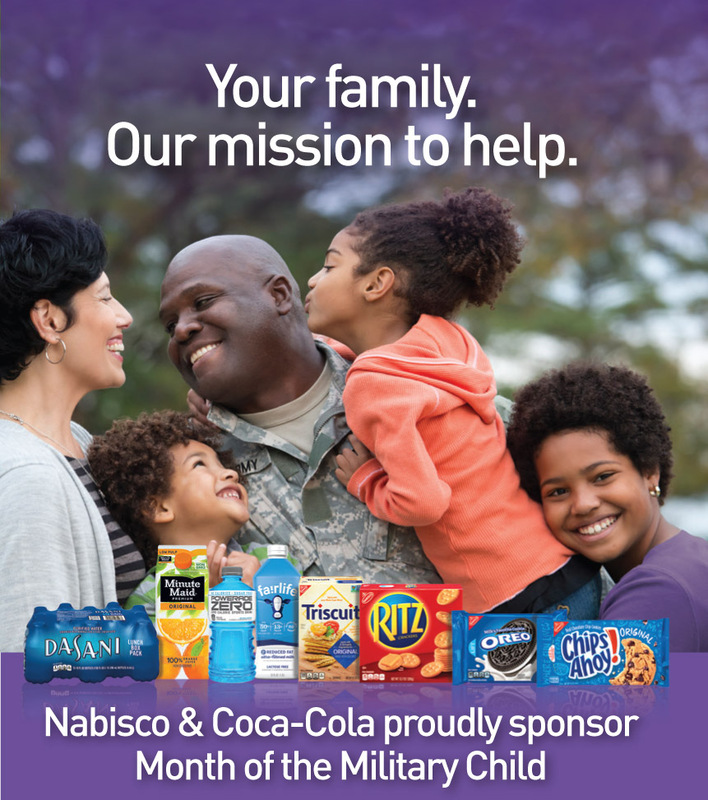 Nabisco & Coca-Cola are proud sponsors of the Month of the Military Child! All month, look for Purple Up events at a military base near you! From major supporters, like Nabisco and Coca-Cola, to national supporters, like DoDEA, or local events, military kids are being celebrated and supported all month long. Supporting military kids and their education is important. Having Nabisco and Coca-Cola on-board and showing their belief in education for military children is a huge deal! It’s not just major businesses or organizations that can act to support military kids. Anyone can help military kids find support, resources and success. All it takes is just a little bit of action or one click to start making big changes for our littlest warriors! This April, help support your military child’s education and future with a cool scholarship opportunity! And share Nabisco and Coca-Cola’s scholarship content with other military families. How does your family support your military child at school? What do you do for Month of the Military Child? *NO PURCHASE OR TEXT NECESSARY TO ENTER THE NABISCO MONTH OF THE MILITARY CHILD SWEEPSTAKES. Making a purchase or sending a text will not increase your chances of winning. Sweepstakes starts 12:00 am ET on 4/1/19 and ends 11:59 pm ET on 4/30/19. Open to residents of the 50 U.S. (& D.C.) and active duty U.S. military personnel and their families, stationed within U.S. or abroad, 18 and older. Enter online at www.NabiscoMilitaryMonth.com. See Official Rules for free alternate method of entry. 1 Grand Prize: $5,000. 5 First Prizes: $1,000. Odds of winning depend on number of eligible entries received during sweepstakes period. Void where prohibited. Sponsor: Mondelēz Global, LLC, East Hanover, NJ 07936. Every time I go anywhere on base, there it is, staring me in the face. The dress code. I check it out, every single time. At the commissary, the PX, the on-base post office, the shoppette (or Class Six for non-USMC folks). And I smirk/cringe a little bit every time. 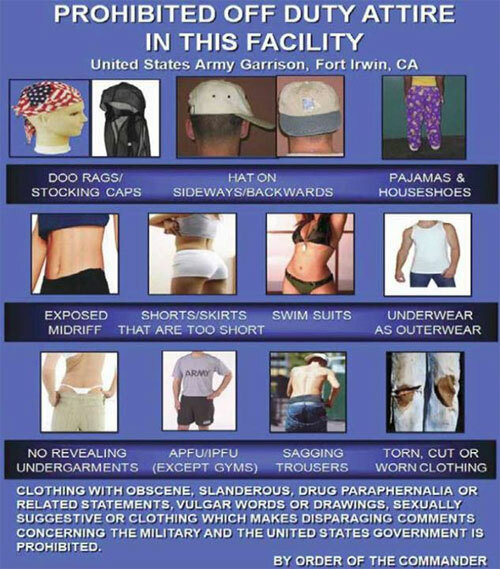 Let’s be honest, the on-base dress code is a smidge, well, old fashioned and out of date. You know that “no workout clothes” rule? Yeah, I break that on the daily with my black leggings. Sorry, not sorry. As a busy mom of two with things to do, I am aiming for comfort all of the time. And my black leggings are super comfy. Yet, I still 100% get why we need a dress code. I definitely understand the ban on shorty-shorts and midriff-baring tops. Ditto for sports bras worn as tops. Gym attire used to be just for the gym. Put it on, get sweaty and then shower up. Today? Almost everything I own is a spandex blend of some sort or other. Leggings, jeans, tops. Yeah, it’s all stretchy. Take a look around today. Go to any military base and visit the commissary or the PX. I’m willing to bet that more than 50% of female patrons will be wearing pants or tops that might be considered “gym” wear. Why? Because they are tight, stretchy, spandex-based athleisure. And everyone is wearing them, every where. If the on-base retailers want to spend their time kicking folks out over athleisure-style leggings, that’s totally their prerogative. I get it, I’m technically breaking the rules by wearing leggings. But I’m definitely not going to stop wearing leggings just to shop on base. I’ll go elsewhere. Know what else technically isn’t “allowed” at on-base retailers? Flip flops. Which I, and almost everyone I know, wears almost exclusively all summer long. For those of us located in year-round warm climates, like SoCal or Hawaii, sandals are a way of life. I know that patrons have been kicked out of the commissary or the Exchange just for wearing flip flops. It’s definitely more likely at East Coast duty stations, particularly hubs like Quantico. Let’s be clear: flip flops are not shower shoes. Not even close. Shower shoes are typically cheap rubber or plastic things, really thin. They break easily, too. You can pick up a pair for under $5 at Old Navy, Target or Walmart. Now flip flops are more sturdy, with thicker fabric or leather straps. My personal flip flops have embroidery on the strap part. And I’ve had them for about three years or more because they last. These aren’t some throwaway footwear. These are quality. And I would never wear them to shower. Ever. I get that the dress code really means tanks that were meant to be worn as underwear, like camisoles or sleeveless undershirts for men. But the language is so vague that anything without sleeves or with thinner shoulder straps is included. My silk sleeveless top? It’s a tank top. The language of this one needs to be revisited: tank tops covers everything without sleeves that can be worn as a shirt. And that leaves a lot of wiggle room for interpretation. Sure, the posters might be laminated and feature models from the late 1990s or early 2000s, but we all know that these dress code rules are way older. The language just doesn’t match how modern military families live. Plus, the rules are not applied universally. It seems like every single base has their own little quirks and rules, some things that are more tightly enforced than others. It’s time for our on-base civilian dress code to catch up to the 21st century, a time of leggings and flip flops. Where tank tops in warm weather is typical for men and women. I understand the need to discourage folks from going straight from the gym to the commissary or PX. It’s smelly and sweaty! But keeping athleisure-type spandex as a “banned” items? Please, that’s ridiculous. I get the desire to maintain modesty. After all, the military does maintain high standards! Discouraging short shorts and peek-a-boo undergarments is absolutely understood, and much appreciated. Personally, I like to shop on base. Prices are reasonable for many items and it’s tax-free. Plus, for many years, it’s been convenient for my family, an easy way to save a little on our food bills. I also don’t reveal a lot of skin or really skate too far outside the lines – other than my leggings, flip flops and occassional tank top. Bottom line: it’s time to check the dress code rules against accepted civilian attire worn by a majority of military spouses and off-duty troops. It’s out of date and restricts the ability of patrons to shop on-base (when enforced). Do you think that the on-base dress code needs an update for the modern era? Comment below with your thoughts! After a long, cold winter (for most of the US), it’s finally spring! Which means flowers, sunshine and fun spring break vacations for military families all over the world. But…where to go? There are so many options, often right in your own back yard. It can be super hard to choose just one cool thing to explore! Discover cool options near and far with the Military Shoppers Travel Rewards program! With flexible search options, you’ll be getting a sweet deal for spring break adventures into the bargain. I spend so much time searching online for ideal vacations, reading review sites and playing with different dates or lengths. Even then, I’m not quite sure what I’m getting myself into sometimes. I love that I can search by weeks and change the dates super easily. Plus, I can make my search as wide or narrow as I’d like. From searching the whole US to looking just in the New Hampshire mountains, it’s simple to check out a ton of options. There are international options, too! I’m able to price compare dates at one hotel or between hotels to find the best price with the best amenities. Then I can try to tailor my vacation to the lowest prices across flights and lodging. I loved that I could search throughout a whole state, like Virginia, or narrow it down by city or region, like inland or coastal. Again, keeping it flexible in terms of where we’ll be traveling because military life. Best of all, the lodgings, activities, air and cars are all sourced from major retailers. And members can leave reviews to share their experiences. It’s so helpful when you’re stuck between hotels or even two different destinations. Military Shoppers Travel program does require that you sign up for the service. The entry level is free and, best of all, earns points with every booking you complete through the website. To earn more points with each vacation, you can level up your account with paid memberships. When you book, you can redeem points to decrease the cost of your trip. Each point takes one dollar off the final total. Spring break is coming up and that means you’re likely shopping for a great trip. To help you prep, we scouted a few great options for you to check out in prime vacation destinations. Virginia Beach, VA: Check-in to a beach-side resort and enjoy the start of summer in style! Hotels start at $39/night and many offers pools or other amenities. Enjoy local attractions like the Virginia Beach Aquarium, the Cape Henry Lighthouse and Neptune’s Park. Cape Cod, MA: It might be a smidge chilly in early spring, but it’s the perfect way to miss the summer crowds while enjoying all the fun – except maybe ocean swimming! Hotels start at $70/night and are often located near area attractions. Wander along the Cape Cod National Seashore, eat all the seafood and poke through local boutique shops. San Diego, CA: It’s a year-round vacation destination, and a top military hub! Enjoy sun, surf and an amazing food scene, with hotels starting from $58/night. You’ll love exploring the San Diego Zoo, Balboa Park and the USS Midway. Aspen, CO: Enjoy some spring powder in the Rockies! Ski or snowboard with your families, with rooms starting at $90/night. Rent your board or skis, try a ghost tour or explore Aspen’s history! We’ve had a great time traveling around Asia for the last three years, but we’re ready to explore the US with our family! Luckily, Military Shoppers has connections to amazing hotels and resorts around the States. PCS Hotel Stays: Locked out of on-base TLF? Use the Military Shoppers program to scout extended stay hotels near your next duty station! Make your search super specific to include your desired amenities, like kitchenettes or multiple bedrooms. Family Vacations: We love to check out different vacation spots near and far. I love that I can check options by the week and within a large date range – up to 60 days! It helps with finding a location that’s great for kids and is at a price point that work for our budget. Girl’s Trips: I’ve been plotting ways to get my friends together for fun adventures, without spouses or kids. With options to search in cool locations, like Charleston, New Orleans or Savannah, it looks like my next weekend getaway with friends is coming sooner rather than later! Holiday Travel: We’d love to be able to visit family during or around the holidays, but it can be tough to gauge the best prices and times to travel. I’m excited to use Military Shoppers to help make our holiday travel more affordable! Do you use Military Shoppers Travel & Rewards program? Share your stories and tips with us! Every three years, I swear that I’m going to do it. I’ll actually organize the house to PCS better, to make things more efficient. I’ll sort, store, trash and donate starting six months out from our move. I swear I’ll be super prepared! And yet, here we are, 3 months from our next move with a house that is even more of a disaster than the last PCS. All my promises of doing better, organizing more effectively, apparently disappeared along the way. But this time I don’t have the luxury of just letting things go again. I need to get my house into optimal PCS mode. It’s crunch time. We’re coming up on this move sooner than later; the days are literally speeding by! So I called in a pro, Melissa Rogers of Modified by Melissa. She’s an organization guru! Plus, as a military spouse, Melissa totally gets the need to be ultra organized to prevent PCS disasters. Melissa’s number one tip is to sort and separate your paperwork and documents before the movers arrive. So, good news for me! We’ve been doing this for years! I’d still like to go back through and weed out the documents we no longer need and pull out the ultra important stuff. Paperwork that should be hand carried includes birth and marriage certificates, health records (a digital file is fine), professional licenses, insurance, and anything else that’s irreplaceable. If you’re traveling with a pet, keep copies of their health documents with you, too. Melissa recommends sorting and storing these valuable papers in a binder or folder with lots of pockets. Another great option is to scan all of these important documents and store them digitally. Even if you need to “official” copy with a seal, the digital files at least create a papertrail. I’ve got a few bottles of half used perfume and lotion floating around at all times. That stuff is expensive! I’m not about to trash it just because we’re moving. But I also don’t necessarily want to waste precious suitcase space on those toiletries either. However, actually packing your liquids can be iffy. To help your spillable stuff make it safely, Melissa recommends that you put a bit of plastic wrap under the cap, over the opening. Tighten the cap down over the plastic wrap. It will create a seal and stop spills. Another option is to place your liquids into sealable plastic bags. If something does spill, it will at least be contained in the bag! To help you unpack later, try to sort your liquids by type: cleaning supplies, soaps, lotions, perfumes and so on. Sorting this way will also prevent your stuff from getting mixed up or spoiled if spills happen. Plus, you’ll be able to quickly place each bag into the correct spot when you unpack! Did you know that packers will just pack everything in one area? Yup, if it’s in the same general area then it’s all going in the same box! This explains why my linens keep ending up with the board games. According to Melissa, it can help to sort your belongings and put some space between things. Consider putting all your towels and other linens together, maybe mixing in other blankets or clothes. Keep artwork and other wall decor in the same section. Basically, if you want things packed together, put them in the same spot to begin with. And if you’d prefer to keep your knives out of the breakables, put them far apart on packing day! I’ve been making passes through my clothes (and my kid’s clothes) for the last six or so months. I’m trying to weed out things that we no longer wear or that are too small or just plain worn out. I always seem to skip cleaning out my pantry and supply closets though. Which leaves me with boxes of random non-perishables and half-empty bottles of Windex. Before the movers come, make a sweep of your kitchen. They’ll pack anything that it’s a liquid. We learned the hard way when we opened up a neatly wrapped package containing a 1/4 full bag of white sugar. Melissa recommends that you pull out anything you really don’t want to see again. Some items to consider removing include anything open, expired, or that you plan on eating between pack out and move out. Do the same hard edit to your cleaning supply closets. Trash or “regift” whatever you don’t want to take with you. Truth time: you’re gonna need to keep some things secure during the pack out process. Documents, packed suitcases and those last minute cleaning supplies are all things that you 100% do not want the movers to pack. We’ve all heard the horror stories about orders or passports getting mixed into moving boxes. To prevent that type of calamity, keep everything you’ll need after the packers leave and on the road (or on the plane) in a separate locked room. Put a sign on the door to keep movers out, too. Living OCONUS? Consider adding a translated sign in the local language, too. What are your best PCS organization tips and tricks? We’d love to learn some new ways to have a smooth move! PCSing is on everyone’s mind right now. Between safety hazards in on base housing and the fear of losing literally everything during the PCS process, military families are on edge right now. It seems like military powers that be are prepared to make big changes to the PCS system. But before they do that, I thought I would offer some helpful tips to improve the current PCS system. Right now, the big idea on the table is privatizing the PCS system. Basically, one person oversees the process and contracts it out. This would be instead of the current system with multiple steps in the contracting process. There are some issues with privatizing though. First, you just have to look at the recent Congressional hearing about privatized base housing to see just how hazardous outsourcing can be for customers. Second, none of this would happen for several years, with the earliest proposed changes coming in 2021. However, there are some simple steps that we can take to help protect military moves right now. Year after year there are issues with who is showing up to actually pack boxes and load trucks. I get it. This is not a glamorous job and is really hard work. But a quick background check would be great. Some ID before getting hired would be nice, too. There have been lots of anecdotal stories passed around over the years about less than savory characters being placed in charge of packing the worldly possessions of military families. Having some measures in place to prevent spur of the moment “hires” for packing personnel would be great. Maybe a list of approved employees that needs to be presented to the gate guard for on base homes would be nice, or a similar ID check method for all military families. Really, I just want to know the people packing all my stuff into boxes. I want to make sure they’re legit and vetted before I hand over everything I own. Sometimes, it’s not the actual packers that cause worry. Instead, it’s the days or weeks that our household goods are in transit. Whole shipping containers are lost, trucks wrecked in accidents, and individual items go missing. Clearly, if the entire military spouse community is talking about this, these incidents are not isolated or unusual. It would be nice to have basic tracking measures put in place to make sure that HHG are being moved in a timely and secure measure. One idea is QR codes or bar codes that can be scanned to update progress. Increased security measures would also be nice. I recognize that a lot of things are out of my control, especially when my things are on a moving truck and I’m not. But having additional locks, alarms, or other protections doesn’t seem like too much to ask. Could all the military TMO/DMO/whatever you’re calling it now shops please coordinate your messaging? That’d be great, thanks. It’s incredibly annoying when families are getting different advice about the “rules” based on where they live or which person they talk to on a given day. One day, you could be cleared for certain things and the next it’s all taken away. This issue is especially frustrating for moves to or from OCONUS locations. Between coordinating flights and pets and shipments, it’s enough. To add in all the contradictory and flat out wrong information is too much. Figure out your party line, share it to every single military moving office, and stay on message. Our moving company didn’t show up until 9pm one year. They were slated to arrive at noon. Guess who we couldn’t get in contact with? Oh, the representatives from the actual moving company and the military-side coordinator. Not having a resource to contact when things go badly is great. Of course, there are definitely moving companies and military coordinators who go above and beyond. But that’s not standard or uniform. If anyone wants to learn how to pack stuff the right way, please come to Japan. My grocery bags are efficiently arranged to minimize breakage and spread out the weight. If the baggers at the grocery store take this level of care, I can only imagine what my actual moving experience will be. I’m prepped for extra layers of wrapping and many boxes of beautifully sorted items. My big pet peeve is when random things get thrown together. Like knives in with my framed paintings and canvas-based art. Or a wrapped bag of flour. Maybe a fully potted plant, soil included, nestled gently in my white linens. A quick run down on proper, common sense packing tactics would be ideal. We’ve been pretty lucky (knock on wood). Over the last decade or so, our damages have been minimal and incidental. A cracked Foreman grill here, and shattered (antique from my Nana) tea cup there. Nothing has been so major that we’ve needed to file a claim. But I’m waiting for it to happen. I’m prepared for months of battles and storing otherwise worthless items just for the inspection. We’ve got piles of receipts for high-cost items, like our TVs ready to deploy. It shouldn’t be this way. I shouldn’t need to live with a molding and damaged beyond repair sofa for months while the claim is processed. It’s taking up valuable living space in a probably cramped home. There’s got to be an easier way to ensure that damaged items are replaced or compensation is paid in a timely manner. What are your suggestions for easy-to-do fixes for the PCS process? We’d love to get your input!